Baccarat is a game associated with high dollar players, because it is traditionally played by well-dressed players in a roped-off section of the casino. New gamblers might think such a game is “elite” because it requires special skills and knowledge. In truth, the exact opposite is true. Baccarat offers a house edge as low as any other game which doesn’t require specialized strategy knowledge, which is why casino operators haven’t always offered it to the general public. The game is easy to learn, easy to play, and requires no skill to play. One you determine how much to gamble, the game plays out with a clockwork regimentation. The object of baccarat is to get as close to 9 as possible with the two dealt cards, or three if a draw is required. 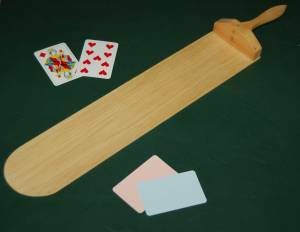 Punto banco and its variants are point-based games. Suits, straights, and pairing have no meaning. Aces are worth 1 point. Tens, jacks, queens, and kings are worth 0. All cards from 2 to 9 are worth their face value. Aces are worth 1. If your hand reaches 10 or more, you simply start over the count. So a combined ten is worth “0”, a combined eleven is worth “1”, and so on. Three decks of cards are combined by the shoe deck. Once the cards are shuffled, two hands are dealt to the players and one hand to the bank. One hand is dealt to the right side of the table, while a second hand is dealt to the left side. Players must bet on the hand on their side of the table, but they have the option to bet on both player hands, if they choose. When this happens, the wager goes to the center of the table. Players can bust the dealer by “going bank”. If the player’s challenge wins, they occupy the banking seat. If they fail at three challenges, they cannot try to bust the current banker again. The idea of “flow” is innate to Chinese thought, due to the concept of “chi” flowing through the human body and our surroundings. In Macau, players are allowed to view the game without betting, so when a gambler begins, they wait a few hands to sense the flow of the cards. While rationalists will argue this has no connection to probability, it’s an important concept in the Far East and one at the heart of baccarat’s popularity.